in many cases we have added information to the (often very brief) NC entries that need further explanation (e.g. clause and phrase). Please note that in line with our practice throughout the site, we use capital letters for function terms such as Subject, Direct Object, Indirect Object, Modifier, etc. Although this convention is not followed in the documentation published by the Department for Education we have also done so in the text that forms part of the National Curriculum Glossary. Tip: Within our units and resources, Glossary items appear highlighted within the text. When you hover over them, or click on them in the Slideshow, a popup is generated. The simple form of an adjective (or adverb): the form that is not comparative or superlative. For example, in the following sequence the first form is the absolute form: great - greater - greatest. A noun with an abstract (non-material) meaning, e.g. imagination, unhappiness, truth. Abstract nouns contrast with concrete nouns like rock or blackbird, which refer to things that can be perceived by the five senses. Features of pronunciation which identify where a person is from, either regionally or socially. The form taken by certain pronouns when they function as Object (Direct Object or Indirect Object) or after a preposition. E.g. them, me in The dog chased them, The baby smiled at me. Sometimes called the objective case. Contrasts with the nominative case, e.g. they, I. A type of initialism in which the combined initials of the new word are pronounced as ordinary words. Examples include NATO, but not UN, because in the latter, each letter is pronounced separately. See also initialism. A category of verb based on meaning. Action verbs denote physical actions, such as whacked, sprint, scribbling and moved. An active verb has its usual pattern of Subject and Object (in contrast with the passive). Active: The school arranged a visit. Passive: A visit was arranged by the school. Active voice is the more common pattern, which contrasts with the passive voice. In an active clause the agent is expressed as the Subject, e.g. My sister painted the fence. When an active clause is changed into a passive one, the patient becomes the Subject: The fence was painted by my sister. A phrase headed by an adjective. Examples (with the Head underlined) are messy, very enthusiastic, quite fond of dogs. Note that the National Curriculum stipulates that phrases should have at least two words, though it concedes in the entry for noun phrases that "Some grammarians recognise one-word phrases." Express an attribute of a person or thing. Can be in an attributive position before the noun. Can be in a predicative position after the verb. A functional label sometimes used for a constituent in a phrase or clause which is often optional and is not dependent on the presence of a particular kind of Head. The term used here for an Adjunct within a clause is Adverbial, e.g. yesterday in I went to the beach yesterday. Adverbs often modify verbs, and can also modify adjectives, other adverbs, or entire clauses. The surest way to identify adverbs is by the ways they can be used: they can modify a verb, an adjective, another adverb or even a whole clause. Adverbs are sometimes said to describe manner or time. This is often true, but it doesn't help to distinguish adverbs from other word classes that can be used as adverbials, such as preposition phrases, noun phrases and subordinate clauses. On the distinction between adverb and Adverbial, see the entry on the latter. A phrase headed by an adverb. Examples (with the Head underlined) are angrily, very quickly, fortunately for him. An Adverbial is a word or phrase that is used, like an adverb, to modify a verb or clause. Of course, adverbs can be used as Adverbials, but many other types of words and phrases can be used this way, including preposition phrases and subordinate clauses. Early application from students abroad is advised. However, where there is time to do so, students who are uncertain about their qualifications should write in the first instance to the Assistant Registrar, to check that they are eligible for consideration. By April eighty-seven, Dr. Reeves noticed that the floor of the eye socket was sinking. Nevertheless, on the eighteenth of May she resumed work as a nursing auxiliary in the out-patients department of Pembury Hospital. Reluctantly , we left the theatre. In the evening, we had a party on the beach. A short element which is added to a word to create a different word form or a new word. For example, adding -ise to terror makes the word terrorise. An affix can be either a prefix, added at the beginning of a word, or a suffix, added at the end. A semantic role which indicates the ‘doer’ of an action described by a verb phrase in a sentence or clause. It can be expressed in different ways. For example, Fiona is the agent both in Fiona drove the bus and in The bus was driven by Fiona. A passive clause which has no by-phrase or agent, such as All the chocolate was eaten, which does not tell us who did the eating. An agentless passive may be used because the speaker does not know who the agent is, thinks it unimportant to specify the agent, or wants to avoid specifying the agent. A term for the way one grammatical element matches ('agrees') with another in some way, usually used for Subject-verb agreement, where a present tense verb changes form depending on the number (singular vs. plural) of the Subject. E.g. The baby cries (singular) vs. The babies cry (plural). The apostrophe, written ', is one of the 9 main punctuation marks in English. Aspect is a grammatical notion, and refers to the way in which the unfolding of situations over time is encoded in language, typically through the use of grammatical patterns involving auxiliary verbs. For example, They are discussing it uses progressive aspect and presents the action as ongoing. Some grammarians refer to the perfect construction as 'perfect aspect', as in They have discussed it, which indicates that the action occurred before the present, but has relevance in the present. Other grammarians refer to perfect constructions as 'perfect tense'. An auxiliary verb that is used to mark aspect. The verb be is an aspectual auxiliary, e.g. in the past progressive construction They were watching TV. Some grammarians say that the perfect construction represents aspect as well. In that case, have is an aspectual auxiliary, e.g. in He has sold his car. The position before the Head noun in a noun phrase which is held by a modifying element such as an adjective. For example, in a helpful person the adjective helpful is in attributive position. See also predicative position. Auxiliary verbs 'help' the main verb they precede by adding further shades of meaning such as aspect or modality. E.g. They are leaving; She has finished; We should help him. The basic form of a word to which inflections can be added to make other forms. E.g. clap is the base form of a verb, and is the starting point for making other forms such as clapped, clapping. This term is often used interchangeably with root word. A mode of communication which shows a mixture of features, some associated with spoken language and some with written language. For example, texting is often described as being a blended mode. A word formation process by which two words are blended together. Conventional examples include brunch and ginormous. More recent interesting examples include mansplain and procrastibake. A preposition phrase in a passive clause which starts with by and typically identifies the agent, as in The fire was started by some campers. The by-phrase is absent in agentless passive clauses. Case is a grammatical term for the different forms a pronoun can take depending on their position or role in a sentence. For example, many of the English personal pronouns can occur in the nominative (or subjective) case (e.g. She likes the cat) or in the accusative (or objective) case (e.g. The cat likes her). Pronouns can also take the genitive case, as in Her cat is very lazy. A clause is a special type of phrase whose Head is a verb. Clauses can sometimes be complete sentences. Clauses may be main or subordinate. Traditionally, a clause had to have a finite verb, but most modern grammarians also recognise nonfinite clauses. A clause is a structure which typically expresses a situation such as an action, process or state of affairs (declarative clause), but it can also be used to ask a question (interrogative clause) or issue a command (imperative clause). One or more clauses can make up a sentence. For example, He will find them is a main clause which stands alone as a sentence. By contrast, that he will find them is a subordinate clause functioning as a Direct Object within the main clause I know that he will find them. The National Curriculum defines clauses as "a special type of phrase whose Head is a verb". This idea is similar to regarding a group of words whose pivotal element is a noun as a noun phrase, and a string of words whose main element is an adjective as an adjective phrase. A classification of clauses into four grammatical types: declarative, interrogative, imperative and exclamative (sometimes called sentence moods or sentence functions). Each type is typically associated with a different discourse function: statement, question, directive (or command), and exclamation, respectively. The National Curriculum uses only the latter set of terms for both structure and function. It was in Brazil that I was so happy. This is a cleft version of I was so happy in Brazil. A process of word formation whereby an existing word is shortened to form a new word. For example, telephone is shortened into phone. A type of interrogative clause in which an auxiliary verb appears before the Subject. Closed interrogatives are used to ask questions whose answer can be yes or no. See interrogative clause and Subject-verb inversion. Coherence refers to the semantic relationships that exist within a text between words, phrases, etc. When we talk only of the grammatical links we speak of cohesion. Cohesion refers to the grammatical relationships that exist within a text between words, phrases, etc. When we talk only of the semantic links, i.e. the meaning links, we speak of coherence. A text has cohesion if it is clear how the meanings of its parts fit together. Cohesive devices can help to do this. In the example, there are repeated references to the same thing (shown by the different combinations of bold, capitals, underlining and asterisks), and the logical relations, such as time and cause, between different parts are clear. A visit has been arranged for YEAR 6, to the Mountain Peaks Field Study Centre, leaving school at 9.30am. This is an overnight visit. The centre has beautiful grounds and *a nature trail*. During the afternoon, THE CHILDREN will follow *the trail*. Cohesive devices are words used to show how the different parts of a text fit together. In other words, they create cohesion. A label for the main use (or discourse function) of an imperative clause. For example, Close the door! is an imperative clause which would typically be used to instruct the hearer to do (or not do) something. Any noun which does not belong to the special class of proper nouns; examples are bus, politician, bravery. Proper nouns are those which refer to specific individuals, places, institutions and so on; examples are Paul, Switzerland, Boots. The form of adjectives (and some adverbs) that ends in -er (e.g. quieter, faster). Sometimes a periphrastic form is used, e.g. more competent (rather than *competenter). See also superlative. A preposition made up of more than one word, e.g. because of, on top of. A sentence containing a main clause with at least one subordinate clause inside it, e.g. I looked after the children while Sam was away. This whole sentence is a main clause which contains a subordinate clause, while Sam was away.In the National Curriculum the term multi-clause sentence is used. A compound word contains at least two root words in its morphology; e.g. whiteboard, superman. Compounding is very important in English. A root word is also known as a lexical base. Compounds are written in different ways: sometimes as one word, sometimes hyphenated, and sometimes as separate words. A neoclassical compound is a compound consisting of two combining forms derived from classical languages, e.g. bio- + -graphy. A sentence where two or more main clauses are joined together, e.g. [Sam made a cake] and [Anna bought some biscuits]. The clauses which are joined are ‘equal’ in status, as each could stand alone. The National Curriculum prefers the term multi-clause sentence. A noun that refers to something that can be directly perceived by the five senses, such as baby, frog, or skyscraper. Concrete nouns express a different type of meaning from abstract nouns like sadness. It is debatable whether non-tangible things that can be perceived by the senses, such as sound, are concrete. Nouns like pain can be seen as having a concrete meaning ("physical pain" perceived by the five senses) and an abstract meaning ("emotional pain" not perceived by the five senses). One element in a set of two or more items linked by a coordinating conjunction. E.g. in the sun and the moon the noun phrases the sun and the moon are conjoins linked by the coordinating conjunction and. A conjunction links two words or phrases together. coordinating conjunctions (e.g. and) link two words or phrases together as an equal pair. subordinating conjunctions (e.g. when) introduce a subordinate clause. The principal coordinating conjunctions are and, or and but) and some typical subordinating conjunctions are because, when, that, if, whether, for). The 2016 GPaS test sample papers also refer to conjunctions as joining words. 'Connective' is an old term that has been widely used by teachers for words that can connect units of information in various ways. These include words like however, so and nonetheless, and because, although and after. In most contemporary discussions of grammar, and in the 2014 National Curriculum, the term 'connective' is not used because the words that have been given this label belong grammatically to different word classes. Instead, we distinguish between subordinating conjunctions, coordinating conjunctions and certain types of adverbs. Subordinating conjunctions place one clause in a lower (subordinate) relationship to another. He is only six years old, although he is very tall. They devoured the cookies because they were hungry. Everyone loves vacations in Hawaii. Nevertheless, I would never want to go there myself. I have lots of friends, so I'm very happy. Note that the adverbs above can be omitted, and the result would still be a grammatical sentence. The conjunctions in the first two examples cannot be omitted without the result becoming a "run-on" sentence. This is just one very good reason why these two types of connective words (conjunctions and adverbs) are not part of a single grammatical category. Although the label 'connective' can be useful as a general notion that encourages students to think about how they might connect one piece of information to another, we would strongly encourage you to avoid it. Most of the letters of the alphabet represent consonants. Only the letters a, e, i, o, u and y can represent vowel sounds. The term 'consonant' is used either for a sound made by bringing the vocal organs together or close to each other, or for a letter used to write a consonant sound: for example, the sound at the start and end of the word mat is a consonant sound, written with the consonant letter m.
A test by means of which a string of words can be shown to behave as a unit, or constituent. See e.g. fronting. One word or a group of words which grammatically behaves as a unit. In language, this is our ability to represent and perceive the same thing in infinitely different ways. For example, we can choose to represent something in a very vague way (e.g. something happened) or a very specific way (e.g. a terrible monster appeared out of the wardrobe). A word with a full meaning content which can be stated separately, such as strawberry, chatter or green. Also called a lexical word. This type of word contrasts with a grammatical word, whose role is mainly to express grammatical relationships or meanings, e.g. of, and or the. Content words are usually open-class words, while grammatical words are usually closed-class words. Words or phrases are coordinated if they are linked as an equal pair by a coordinating conjunction (i.e. and, but, or). In the examples below, the coordinated elements are shown in bold, and the conjunction is in red. The difference between coordination and subordination is that, in subordination, the two linked elements are not equal. In coordination, elements or strings of elements (conjoins) are juxtaposed by means of a coordinating conjunction. E.g. Bulgaria and Greece. Another term for coordinating conjunction; a linking word which connects units which are equal in status. Common examples are and, or, and but. A subset of modal verbs that is considered the most typical and most important. The core modals are: will, would, can, could, will, may, might, shall, should, must, and ought (to). A collection of extracts of naturally occurring spoken or written language, often in computerised form. It can include written language and/or transcribed spoken language. A type of noun which can be counted, like computer (one computer, two computers, three computers, etc.). In contrast, there are non-count nouns like software which can't be counted. The most common clause type, which usually has regular grammatical ordering with the Subject before the finite verb, followed by the Object (if there is one), and which is usually, though not exclusively, used to make a statement. See also: exclamative clause, imperative clause, interrogative clause. In English the word the is called the definite article. The indefinite article is a(n). Both belong to the word class of determiner. The way that language can refer or 'point' to different things in different contexts. For example, the demonstrative pronoun that in spoken English can refer to a specific thing in the real world at a particular moment, but it can be used to refer to different things by different people in different times and places. Personal pronouns like she and it also show deixis, and are said to be deictic. One of a small set of pronouns (this, that, these, those) which are used to 'point to' ('demonstrate') something which can be identified from the context (e.g. This is nice). 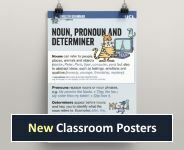 When this, that, these, and those are placed before nouns we label them as determiners. See also: deixis. The process by which one word is derived from another. For example, the adjective readable is derived from the verb read by the addition of an ending (or suffix), while the verb butter is derived from the noun butter without any change of form. A descriptive approach to language aims to describe the way people actually use the language. It contrasts with a prescriptive approach, which aims to give people rules for how they should use language. A determiner specifies a noun as known or unknown, and it goes before any modifiers (e.g. adjectives or other nouns). 'Determiner' is a word class label. It's a cover term for a range of word classes that are also known by other names, as the National Curriculum entry makes clear. Determiners typically occur before a noun within a noun phrase to indicate the type of reference the noun has, e.g. the, a/an, this, that, many, all. The so-called cardinal numerals, e.g. one, two, three, as in I ate three bowls of spaghetti, are sometimes included in the class of determiners. However, their classification is disputed, because there are also reasons for regarding them as nouns, for example the fact that we can pluralise them, as in They travelled in twos and threes. The ordinal numerals, e.g. first, second, etc. are adjectives. In a few cases determiners occur outside noun phrases, e.g. I don't like chocolate that much. A regionally or socially distinctive variety of a language, identified by a particular set of words and grammatical structures. A type of grapheme where two letters represent one phoneme. Sometimes, these two letters are not next to one another; this is called a split digraph. The digraph ea in each is pronounced /i:/. The digraph sh in shed is pronounced /ʃ/. The split digraph i–e in line is pronounced /aɪ/. A function label for an element in the clause which typically comes after the verb phrase and identifies the person or thing that undergoes the situation described by the main verb. For example, in Greg stroked the dog, the function of Direct Object is filled by the dog. See also Object, which is the term preferred in the National Curriculum. Discourse markers (also called pragmatic markers) are usually short words, phrases or clauses that are used by participants in spoken language to signal various meanings such as agreement, anger, surprise, etc. They can also signal a change in speaker (turn-taking) or the desire to terminate a conversation. Examples are ah, oh, well, yeah, oh my god, etc. A term which refers to the arrangement of words, phrases, and so on in sentence structure. For example, in observing that in English sentences noun phrases typically occur in Subject position, Direct Object position, and after prepositions, we are talking about the distribution of noun phrases. An auxiliary verb that is inserted by do-support to add emphasis, to form interrogative structures, etc. It is called dummy because it does not carry strong lexical meaning. Instead, it has a grammatical purpose only. See past participle and participle. She did it because she wanted to [do it]. The general definition of an exclamation is an utterance that expresses an emotion such as surprise, anger or admiration. In the National Curriculum this term is defined in a specialised way, namely in the way we define exclamative clauses in the entry below. See also: clause type, command, directive, statement, question. The word there that we find in sentences or clauses that are concerned with the existence of people, things, etc. E.g. There is a cat in the garage. See also locative there. An expanded noun phrase is a noun phrase that has elements in it other than a determiner and a noun, e.g. the smelly cheese in the fridge. The movement of a string of words to the left or to the right in a sentence. For example, in the sentence It is wonderful to see you, the Subject clause to see you has been moved to a sentence-final position, and nonreferential it has been put in its place. The canonical form of the sentence (without extraposition) would be To see you is wonderful. A feature of spoken language used to cover a pause or break in speech. For example, many speakers say uh, uhm, or er, and so on to fill pauses in speech. Fillers can be observed and studied in corpora. Finite verbs are verbs that carry tense and (with the exception of imperative clauses) have a Subject. Every sentence typically has at least one verb which is either past or present tense. Such verbs are called ‘finite’. The imperative verb in a command is also finite. Verbs that are not finite, such as participles or infinitives, cannot stand on their own: they are linked to another verb in the sentence. Note that the term finite is applied to a verb to indicate that it carries tense, and also applied to a clause or sentence that contains a finite verb. Another term for grammatical word. A category of text, referring to the type of the text and indicating the purpose of the text. 'Genre' traditionally refers to types of written text, so we can talk about a recipe being a subtype of an instructional genre, or stories being found within a narrative genre. If it is applied to types of spoken text, the term register is often used instead. This refers to the property of adjectives (and some adverbs) to express degrees of application of some notion. For example, the property of being warm can be graded, because we can have warmer and warmest (these are comparative and superlative forms, respectively) and also very warm, where the adjective is preceded by an intensifier. This is a term used in linguistics to recognise that on the one hand there are typical and less typical members of grammatical categories (this is called subsective gradience), and on the other hand that the boundaries between grammatical categories may not be absolutely fixed (this is called intersective gradience). For example, let’s look at the fuzziness or gradience of the noun category. Cat, table and apple are all deemed to be ‘prototypical’ members of this category. They are physical objects; they take a possessive form; they can be plural or singular, and they can appear after a determiner. But news and information are more peripheral examples of nouns. The former is always in the plural, and the latter cannot take a plural ending. The structural categories we can assign an element or group of elements to, such as word classes, phrases, and clauses. Form is distinct from the grammatical function that an element or group plays within a larger structure. For example, a group of words with the form of a noun phrase can have different functions in the clause, such as Subject or Direct Object. The term 'form' is also used to refer to the 'shape' or morphology of words. The part that a word or constituent plays within a larger structure - for example, Subject, Object and Adverbial are functions within the clause. Function is distinct from form, which concerns structural categories such as word classes. Functional elements can be 'filled' by different formal elements - for example, in The boy ate the biscuits, the boy is both a noun phrase (form) and the Subject (function). The same noun phrase can operate as the Object (function) in a different example, such as She told the boy. A word whose main role is to express grammatical relationships or meanings, e.g. of, and and whether. These words contrast with content words like laugh or chair, which have separate, stateable meaning content. Grammatical words are usually closed-class words. Another term for grammatical word is function word. A letter, or combination of letters, that corresponds to a single phoneme within a word. The grapheme t in the words ten, bet and ate corresponds to the phoneme /t/. The grapheme ph in the word dolphin corresponds to the phoneme /f/. The links between letters, or combinations of letters (graphemes) and the speech sounds (phonemes) that they represent. In the English writing system, graphemes may correspond to different phonemes in different words. …it corresponds to the phoneme /z/ in the word easy. A grammatical function label which refers to the principal word in a phrase. For example, a noun phrase has a noun as its Head, an adjective phrase has an adjective as its Head, an adverb phrase has an adverb as its Head, and so on. An expression that tempers an absolute statement by qualifying it in various ways. For example, maybe, perhaps, and generally can operate as hedges, as can expressions like it would seem that or as far as I can tell. Hedges can express a speaker's hesitation, doubt, or uncertainty about what is being said, and can also protect a speaker from repercussions of saying something that is incorrect. Two different words are homophones if they sound exactly the same when pronounced. Branch of morphology which looks at different forms of the same dictionary word. For example, laugh, laughs, laughed, laughing are different forms (called inflectional forms) of the verb laugh, which are used in different contexts. See also inflection. The ability to structure the presentation of information in different ways in sentences and clauses, for example to place emphasis on a particular part. Typical strategies for information structuring include employing passive voice and preposing or postposing elements. I really like those shoes ~ Those shoes, I really like [them] (preposing). I left the cake out in the rain ~ The cake was left out in the rain [by me] (passive). A word formation process whereby the first letters of words in a phrase are combined into a new word. Examples include NATO as well as UN. See also acronym. Intensifiers modify adjectives and adverbs to increase their strength (e.g. very cold and extremely carefully). Also known as an intensifying adverb. Despite the name, intensifying adverbs can also decrease the strength of the adverb (e.g. quite untidy). A minor word class consisting of such words as oh, ah, ouch and yuck, which express reactions, emotions and so on. They can occur alone; they can also occur within longer utterances, but do not form grammatical relationships with other words. A universally recognised alphabet for the transcription of human speech sounds. It features a symbol for each sound of the world's languages. A clause type which is characterised by Subject-verb inversion and/or a fronted wh-phrase, and which is usually (though not exclusively) used to ask questions. Examples are Have you looked at this article? and Who told you that? A pronoun which can be used to ask a question, e.g. who, what. A preposition that does not have a noun phrase as its Complement, as in He came in. See also transitive preposition. A verb which does not need an Object in a sentence to complete its meaning is described as intransitive. See transitive verb. Another term for main verb. A verb that conveys the primary action, process or state (e.g. chatter, know, smash), and can be used on its own (e.g. They chattered). 'Lexis' is another way to refer to words. Any item used in grammar to link words, phrases or clauses with other words, phrases or clauses. Among the linking devices we find conjunctions, linking Adverbials and pronouns. See also cohesive device. A sentence contains at least one clause which is not a subordinate clause; such a clause is a main clause. A main clause may contain any number of subordinate clauses. A main clause is a clause which is not subordinate to any other clause and can stand alone as a sentence, e.g. I saw them last night. It differs from a subordinate clause, which functions as part of a larger clause. A verb that conveys the primary action, process or state (e.g. chatter, know, smash), and can be used on its own (e.g. They chattered). It can also be used with one or more helpers called auxiliary verbs (e.g. They were chattering). Sometimes called a lexical verb. A term used for non-count nouns which refer to an undivided mass, e.g. milk, bread, wood. A word or phrase that is used to describe one thing in terms of another, where the literal ("dictionary-definition") meaning is not expressed. For example, when Shakespeare writes Juliet is the Sun, he does not mean that she actually is the sun! He means that she has some of the same qualities as the sun. The opposite of metaphorical is literal. Metaphor is, however, pervasive in everyday language and can operate to shape our way of seeing things. Thus, 'argument' is regularly expressed in terms of to 'war' (we defend a point, attack an idea, marshall facts); we live by metaphors of time analogised as if it were a commodity - thus we spend and waste time. Such metaphors are 'dead metaphors' or sufficiently 'frozen' for them to be not really noticed, though they reveal much about how individuals and cultures shape meanings. A modal verb is an auxiliary verb which expresses modality (meanings to do with what is possible, necessary, and so on). Modal verbs are used to change the meaning of other verbs. They can express meanings such as certainty, ability, or obligation. The main modal verbs are will, would, can, could, may, might, shall, should, must and ought. A modal verb only has finite forms and has no suffixes (e.g. I sing – he sings, but not I must – he *musts). I can do this maths work by myself. This ride may be too scary for you! You should help your little brother. Is it going to rain? Yes, it might. An area of meaning concerned with what is possible, necessary, desirable and so on. This can involve what may or must be true, or what actions are permitted or required. This kind of meaning is expressed by the modal verbs, e.g. may, must, and also by other forms such as certain adjectives (likely, essential) and adverbs (perhaps, probably). The channel by which language is produced, i.e. spoken or written. Spoken and written language are often referred to as the two modes of language. In addition, linguists sometimes discuss text messaging or internet chat rooms as representing a mixed-mode, containing features of both spoken and written language. This is a functional label for an element in a phrase which supports (or 'modifies') the Head word. Adverbials modify verbs or clauses. One word or phrase modifies another by making its meaning more specific. Because the two words make a phrase, the ‘modifier’ is normally close to the modified word. school is modified by primary (to mean a specific kind of school). Other examples of modifiers are happy in the noun phrase a happy bunny, very in the adjective phrase very cheeky and extremely in the adverb phrase extremely quickly. Morphemes are the component parts of which words are made up, e.g. unhappy is made up of the prefix un- and the root word happy. A label used in the National Curriculum to refer to sentences that contain two or more clauses. This includes both complex sentences, where one clause is subordinate to another, as signalled by a subordinating conjunction (e.g. I came home [because it was raining]), and compound sentences, where clauses are 'chained' using a coordinating conjunction (e.g. [I came home] and [my sister went out]). As the distinction between complex and compound sentences is relatively advanced, the National Curriculum recommends that the term ‘multi-clause sentence’ be used up to KS2. A modal verb with a negative element tagged onto it. E.g. can’t, won’t, mustn’t, etc. A word which typically expresses the contradiction of some or all of a sentence's meaning. Examples of negation include 'nt, not, never, not, etc. A compound consisting of two combining forms derived from classical languages (Latin and Ancient Greek), e.g. bio- + -logy. See compound. The form which some pronouns take when they function as Subject, e.g. they, I in They like chocolate, I won a prize. Sometimes called subjective case. Contrasts with the accusative case as in them, me. A noun which can't be counted, such as furniture or software. We can't talk about *one furniture or *two furnitures, for instance. Because many non-count nouns refer to an undivided mass (e.g. lemonade, coal), they are sometimes called mass nouns. Nouns which can be counted, like chair, are called count nouns. A term applied to a verb to indicate that it does not carry tense, and also applied to a clause that does not contain a finite verb. Nouns constitute one of the major word classes, which includes words for people, animals, and things (teacher, rabbit, desk) and also many words for abstract concepts (kindness, mystery, technology). Nouns are sometimes called ‘naming words’ because they name people, places and ‘things’; this is often true, but it doesn’t help to distinguish nouns from other word classes. For example, prepositions can name places and verbs can name ‘things’ such as actions. Our dog bit the burglar on his behind! My big brother did an amazing jump on his skateboard. Nouns may be classified as common (e.g. boy, day) or proper (e.g. Ivan, Wednesday), and also as countable (e.g. thing, boy) or non-countable (e.g. stuff, money). These classes can be recognised by the determiners they combine with. A noun phrase is a phrase with a noun as its Head, e.g. some foxes, foxes with bushy tails. Some grammarians recognise one-word phrases, so that foxes are multiplying would contain the noun foxes acting as the head of the noun phrase foxes. See also expanded noun phrase. A grammatical term for the contrast between singular and plural. This contrast is seen in many nouns (e.g. spider/spiders) and pronouns (e.g. I/we). Objects can be turned into the Subject of a passive verb, and cannot be adjectives (contrast with Complement). Note that Object is a function label which covers two different types: Direct Object and Indirect Object (and some other units typically selected by verbs). We use the label prepositional Object to indicate the function of a unit that comes after a preposition, typically a noun phrase (e.g. on the stairs, with cheese). A function label for an element in the clause which typically comes after the Direct Object and describes the person or thing it refers to. E.g. He found the staff very helpful; I consider the project a success. See also Complement and Subject Complement. A type of interrogative clause introduced by a wh- phrase. Open interrogatives cannot generally be answered with yes or no. Verbs in English have two participles, called present participle (e.g. walking, taking) and past participle (e.g. walked, taken). although past participles are used as perfects (e.g. has eaten) they are also used as passives (e.g. was eaten). Chewing on a sandwich, Pete tried to make a phone call at the same time. Kate flung herself onto the sofa, exhausted by a long day's work. This word class label is given in some frameworks to the preposition-like elements in phrasal verbs, e.g. up in look up. 'Passive' is a term applied to a special pattern (or voice) used in a sentence or clause, formed with the auxiliary verb be followed by a verb in the -ed participle form, as in The fence was painted by my sister. Compare this with the more usual active pattern, as in My sister painted the fence. In the active example, the agent or 'doer' of the action (my sister) is expressed as the Subject; but in the passive example, the patient of the action (the fence) becomes the Subject. the verb be(was), or some other verb such as get. A verb is not ‘passive’ just because it has a passive meaning: it must be the passive version of an active verb. A visit was arranged by the school. Our cat got run over by a bus. The school arranged a visit. A bus ran over our cat. A verb construction conveying that the action described by the verb was ongoing in the past. The English past progressive is conveyed using the auxiliary verb be in the past tense combined with a present participle. The past tense is a grammatical marking on verbs. (See also inflection.) E.g. the verb in She sounded tired is a past tense form (compare the present tense form in She sounds tired). make a request sound more polite. Most verbs take a suffix –ed, to form their past tense, but many commonly-used verbs are irregular. A semantic role which indicates the ‘undergoer’ of a situation in a sentence or clause. It can be expressed in different ways. For example, the dog is the patient in both Julie has washed the dog and The dog has been washed. The perfect construction is composed of a form of have followed by an past participle, e.g. has cooked, have walked, had eaten. adding a form of the verb have before it. It can also be combined with the progressive (e.g. he has been going). Many grammars refer to the perfect construction as a type of aspect. One of a group of pronouns used to refer mainly to people, but also to things. They can be classified by person, e.g. I (speaker/writer: first person), you (addressee: second person), she/he/it (others: third person). /t/ contrasts with /l/ to signal the difference between bought and ball. It is this contrast in meaning that tells us there are two distinct phonemes at work. There are around 44 phonemes in English; the exact number depends on regional accents. A single phoneme may be represented in writing by one, two, three or four letters constituting a single grapheme. Phonetics is the study of how speech sounds are made and perceived. This involves describing, classifying and transcribing sounds. Phoneticians make use of the International Phonetic Alphabet, a system for transcribing all of the sounds found in the languages of the world. Phoneticians also study the speech variation of different accents and dialects. Phonology is concerned with how speech sounds are put together and how they are stored in the mind. A complex transitive or intransitive verb that consists of two parts: a verb and a preposition, e.g. look up (transitive; e.g. He looked up the word / He looked the word up), give up (intransitive; e.g. She gave up.). A phrase is a group of words that are grammatically connected so that they stay together, and that expand a single word, called the Head. The phrase is a noun phrase if its Head is a noun, a preposition phrase if its Head is a preposition, and so on; but if the Head is a verb, the phrase is called a clause. Phrases can be made up of other phrases. We distinguish noun phrases, verb phrases, adjective phrases, prepositional phrases and adverb phrases (though note that the term ‘verb phrase’ is not used in the National Curriculum). You can think of the Head of a phrase as the most important element that tells you what the phrase is a 'kind of'. For example, a neighbour from hell is a kind of neighbour, and an unbelievably weird story is a kind of story. Phrases may include other elements which function as Modifier of the Head. For example, in the phrases above from hell and unbelievably weird are Modifiers. Note: the National Curriculum does not regard single words as phrases, so that in Cats hate dogs, both cats and dogs are simply nouns, not noun phrases, and in I am happy, happy is an adjective, not an adjective phrase. The programme specifications state that: "
The National Curriculum refers to 'clauses' as a type of 'phrase'. This may at first seem a little bit puzzling, but if you think of a clause as a grouping of words whose pivotal element (i.e. Head) is a verb, then it begins to makes sense. Some grammarians prefer to distinguish between 'verb phrases', which do not include a Subject, and 'clauses', which do include a Subject. A term describing a form of a noun or pronoun which refers to more than one person or thing. Singular and plural are contrasting values of number. For example, roses is a plural form which contrasts with the singular form rose. A form of noun (with ' or 's added) or pronoun that is often used to show possession. The relation expressed by a possessive goes well beyond ordinary ideas of ‘possession’. A possessive may act as a determiner. The meaning of a possessive is not always 'possession' in a literal sense, e.g. John's arrival. However, the fact that my and lovely both occur before the noun daughters does not mean that they are both adjectives. If you and I are talking, and I use the former phrase then I'm talking about a cat that is not known to you: it has as yet not been identified. The property of not being identifiable is called 'indefiniteness'. Conversely, the property of being identifiable is called 'definiteness'. So, when I use the phrase the cat in a conversation with you then you are familiar with (or I'm assuming that you are familiar with) the particular cat I'm talking about: it is an identifiable cat. Similarly, when I use the phrase my daughters then the individuals I'm talking about are identifiable to you. Adjectives are grammatically different from determiners: typically they have comparative and superlative forms: lovely, lovelier, loveliest, and they are often gradable: very lovely. However, determiners cannot be modified in this way. We can't say my-er, my-est or very my. A Modifier which comes after the Head word in a phrase, for example with curly hair in the noun phrase the boy with curly hair. A strategy for information structuring involving moving an element (typically a long noun phrase) to a later point in a clause than its expected position. For example, a short Direct Object normally comes immediately after the verb, as in I wrote the date in my diary, but a long Direct Object is sometimes moved to a later position, as in I wrote in my diary all the dates I needed to remember. A functional syntactic label which denotes all the linguistic material to the right of the Subject. See also predicative position. A general term often used to cover the functions of Subject Complement and Object Complement within the clause. The position that immediately follows a linking verb. For example, in the sentence He is helpful the adjective helpful is in predicative position. See also attributive position. A function label applied to the verb in a clause. For example, in The children fed the ducks, the verb fed has the function of Predicator. The term is therefore on par with terms like Subject and Object. A Modifier which comes before the Head word in a phrase, such as the adjective trendy in the noun phrase trendy clothes. An information structuring strategy where a grammatical element is moved earlier in the clause to highlight it. For example, instead of saying I could come on Thursday, a speaker might say On Thursday I could come, stressing the date to the hearer. A member of a closed word class, including of and in, which grammatically link other elements together, and generally expresses relations in space, in time, or in the mind. Words like before or since can act either as prepositions or as conjunctions. Tom waved goodbye to Christy. She’ll be back from Australia in two weeks. I haven’t seen my dog since this morning. A preposition phrase has a preposition as its Head followed by a noun, pronoun or noun phrase. I met them after the party. On the Englicious site we generally use the term prepositional phrase, by which we mean the same as preposition phrase. Another term for preposition phrase. A verb that takes a preposition phrase as its Complement, e.g. rely on something, look at something, etc. A prescriptive approach to language tells people how they should speak and write. It contrasts with a descriptive approach, which aims to describe how people actually do use language. A verb construction conveying that the action described by the verb started in the past but is still relevant now. The English present perfect is conveyed using the auxiliary verb have in the present tense combined with a past participle. A verb construction conveying that the action described by the verb is ongoing in the present. The English present progressive is conveyed using the auxiliary verb be in the present tense combined with a present participle. The progressive (also known as the continuous) form of a verb generally describes events in progress. It is formed by combining the verb’s present participle (e.g. singing) with a form of the verb be (e.g. he was singing). The progressive can also be combined with the perfect (e.g. he has been singing). The progressive construction conveys aspect, in that it indicates that a situation is viewed as an ongoing process. A closed class of words, including he, I and you, which can generally stand in for a noun phrase. it is harder to modify them. In the examples, each sentence is written twice: once with nouns, and once with pronouns (in red). Where the same thing is being talked about, the words are shown in bold. Amanda waved to Michael. She waved to him. John’s mother is over there. His mother is over there. The visit will be an overnight visit. This will be an overnight visit. Simon is the person: Simon broke it. He is the one who broke it. Note that pronouns often occur not just in similar positions to nouns, but also in similar positions to entire noun phrases, e.g. The children went to the park. ~They went to the park. Some pronouns can change their form depending on their function. For example, in Subject position we have I, she, he, we, they, who, whereas in Object position we have me, her, him, us, them, whom. This is a distinction of case. A noun phrase which is used to name a particular person, organisation, place, time, event, etc., such as Edward the Confessor, Winchester Cathedral, the United Kingdom, the House of Commons. It can consist of a proper noun on its own, such as Timmy, London, Oxfam. A special subclass of noun whose members refer to specific people, places, organisations and so on, e.g. Sarah, Liverpool, Microsoft. Other, ordinary nouns (like dog or happiness) are called common nouns. See also proper name. What Janice did was laugh out loud. Punctuation includes any conventional features of writing other than spelling and general layout: the standard punctuation marks . , ; : ? ! - – ( ) “ ” ‘ ’ , and also word-spaces, capital letters, apostrophes, paragraph breaks and bullet points. One important role of punctuation is to indicate sentence boundaries. A label for the main use (or discourse function) of an interrogative clause. For example, Will you dance with me? is an interrogative structure which can be used as a question to elicit either a ‘yes’ or ‘no’ response. Other clause types can also be used to ask questions, e.g. the declarative clause You will dance with me? This would normally be used to make a statement, but can be used as a question if it is pronounced with a rising intonation. See also clause type, command, directive, statement. A word such as who, what, why, and when used in interrogative clauses, typically to ask questions (e.g. Who called you? What did you eat for breakfast?). Received Pronunciation (often abbreviated to RP) is an accent which is used only by a small minority of English speakers in England. It is not associated with any one region. Because of its regional neutrality, it is the accent which is generally shown in dictionaries in the UK (but not, of course, in the USA). RP has no special status in the National Curriculum. A semantic role which indicates the ‘receiver’ in a situation described by a sentence or clause, e.g. Kate in I sent Kate some flowers and I sent some flowers to Kate. The pronoun it that has referential content. E.g. Where is my coat? It is over there. See also nonreferential it. 'Register' is a broad description of the type of sociolinguistic context of written and spoken language, similar to genre in meaning. Classroom lessons, football commentaries and novels use different registers of the same language, recognised by differences of vocabulary and grammar. Registers are ‘varieties’ of a language which are each tied to a range of uses, in contrast with dialects, which are tied to groups of users. 'Register' is frequently used to refer to the degree of formality/informality of a text (a property arising out of the situation), whereas genre tends to have a more traditional 'library classification' meaning (e.g. instructional/informative, fiction/non-fiction). A category of verb based on meaning. Relational verbs denote the relation between two things, such as was and has. A relative clause is a special type of subordinate clause that modifies a noun. It often does this by using a relative pronoun such as who or that to refer back to that noun, though the relative pronoun that is often omitted. A relative clause may also be attached to a clause. In that case, the pronoun refers back to the whole clause, rather than referring back to a noun. In the examples, the relative clauses are in red, and both the pronouns and the words they refer back to are in bold. A pronoun which is used at the start of a relative clause, e.g. who, which, that (the girl who won the race, the necklace which/that I found). Root words are words that can stand alone, unlike prefixes and suffixes, which cannot stand alone. Morphology breaks words down into root words, which can stand alone, and suffixes or prefixes which can’t. For example, help is the root word for other words in its word family such as helpful and helpless, and also for its inflections such as helping. Compound words (e.g. help-desk) contain two or more root words. When looking in a dictionary, we sometimes have to look for the root word (or words) of the word we are interested in. The name of a vowel sound that is found only in unstressed positions in English. It is the most common vowel sound in English. It is written as /ə/ in the International Phonetic Alphabet. In the English writing system, it can be written in many different ways. The participant role which an element plays in the situation described by a sentence or clause, such as agent or recipient. These roles concern meaning and are distinct from grammatical functions such as Subject. For example, Tom plays the role of agent in both Tom painted the fence and The fence was painted by Tom. The study of meaning. It covers the meanings of words and their combinations into larger units (phrases, clauses and sentences). The sentence is the largest unit of grammar, which in the written language begins with a capital letter and ends with a full stop. A sentence may consist of a single clause or it may contain several clauses held together by subordination or co-ordination. Classifying a sentence as a simple sentence, complex sentence or compound sentence can be confusing, because a ‘simple’ sentence may be complicated, and a ‘complex’ one may be straightforward. The terms single-clause sentence and multi-clause sentence may be more helpful. This is a ‘comma splice’, a common error in which a comma is used where either a full stop or a semi-colon is needed to indicate the lack of any grammatical connection between the two clauses. See also clause type, command, exclamation, question, statement. The basic presentation of the past tense verb, with no auxiliary verbs expressing aspect (i.e. progressive or perfect). The basic presentation of the present tense verb, with no auxiliary verbs expressing aspect (i.e. progressive or perfect). A sentence containing only one main clause, with no subordinate clauses inside it, e.g. Kate visited her cousins yesterday. It may also be referred to as a single-clause sentence. This terminology is preferred in the National Curriculum. The term preferred in the National Curriculum for a sentence consisting of a single clause. Also called simple sentence. For example, in He went to school on the bus, there is only one main verb (went) and therefore one clause. By contrast, a multi-clause sentence contains more than one clause. A term describing a form of a noun or pronoun which refers to a single person or thing. Singular and plural are contrasting values of number. For example, banana is a singular form which contrasts with the plural form bananas. A category of verb based on meaning. Speech verbs denote ways of speaking, such as whispered, muttered, shouted and argue. Standard English can be recognised by the use of a very small range of forms such as those books, I did it and I wasn’t doing anything (rather than their non-Standard equivalents); it is not limited to any particular accent. It is the variety of English which is used, with only minor variation, as a major world language. Some people use Standard English all the time, in all situations from the most casual to the most formal, so it covers most registers. The aim of the national curriculum is that everyone should be able to use Standard English as needed in writing and in relatively formal speaking. Note that standards change, and that Standard English in Shakespeare's time, or in Dickens's time, was different from Standard English today. Likewise, Standard English in 200 years will be different from Standard English now. Likewise, standards vary around the world. American English and British English do have some significant differences, such that what is standard in America may be non-standard in the UK. A label for the main use (or discourse function) of a declarative clause. For example, We danced all night is a declarative sentence which would typically be used as a statement. However, statements can also be used in different ways. For example, the following is an example of a sentence that has the structure of a statement, but is used as a question: You like fried bananas?. See also clause type, command, directive, question. A syllable is stressed if it is pronounced more forcefully than the syllables next to it. The other syllables are unstressed. The emphasis that a speaker places on a word or syllable of a word makes the word or syllable louder, higher, and/or longer than other words or syllables. Words have characteristic stress patterns: for example, tiger is stressed on the first syllable while about is stressed on the second syllable. Unlike the verb’s Object and Complement, the Subject can determine the form of the verb (e.g. I am, you are). 'Subject' is a function label for an element in the clause which often identifies the agent that carries out the action expressed by the main verb. However, not all Subjects denote agents (e.g. in Linda felt tired, Linda is not really a 'do-er' - she is not carrying out an action), so the Subject is better defined in terms of grammatical properties. These include its typical position in the clause, and the way it shows agreement with the verb in person and number. A function label for an element in the clause which comes after a linking verb and describes a person or thing picked out by the Subject. E.g. This soup is delicious; Sarah is a good swimmer. See also Complement, Object Complement. A special ordering where a verb comes before the Subject instead of after it. For example, in the interrogative clause Have you told her?, the auxiliary verb have occurs before the Subject you. In some languages, the inflections of a verb include a large range of special forms which are used typically in subordinate clauses, and are called 'subjunctives'. English has very few such forms and those it has tend to be used in rather formal styles. The school requires that all pupils be honest. The school rules demand that pupils not enter the gym at lunchtime. If Zoë were the class president, things would be much better. Subjunctive verbs are triggered by adjectives such as necessary, imperative, crucial, or by verbs such as demand, require, insist, etc. When the subjunctive verb has a third person singular subject, it does not take the -s inflection. I insist that he leave at once. We stipulated that she take a French course. Many grammarians now take the view that English does not have a subjunctive mood. A clause which is subordinate to some other part of the same sentence is a subordinate clause; for example, in The apple that I ate was sour, the clause that I ate is subordinate to apple (which it modifies). However, clauses that are directly quoted as direct speech are not subordinate clauses. A subordinate clause does not function as a sentence on its own but functions instead as part of a larger clause. For example, in the sentence I believe that we will have a hot summer the clause that we will have a hot summer is a subordinate clause functioning as part of the larger main clause: it is the Direct Object of the verb believe. The relationship between two elements of unequal grammatical status, often linked by a subordinate conjunction. Subjects and Objects are subordinate to their verbs. Subordination is much more common than the equal relationship of coordination. Another term for subordinating conjunction: a word that links a subordinate clause with the clause it is dependent on, e.g. because, when, although, that, if. When a subordinator is left out, but could be inserted, we speak of a zero subordinator, e.g. I thought ø you had left, where ‘ø’ indicates the zero subordinator. The form of adjectives (and some adverbs) that ends in -est (e.g. quietest, fastest). Sometimes a periphrastic form is used, e.g. most competent (rather than *competentest). See also comparative. A syllable sounds like a beat in a word. Syllables consist of at least one vowel, and possibly one or more consonants. This term refers to the arrangement of words and other units of language in clauses and phrases and the relationships that obtain between them. The study of sentence structure. It concerns how words combine to form larger units: phrases, clauses and ultimately sentences. A short question added to the end of a clause, such as did he? or wasn’t there?. These short additional interrogative clauses are usually incomplete and refer back to the main clause of the sentence, as in ...there was a large picture of your mother's mother wasn't there? [S1A-007 #167]. Tag questions are common in conversational speech, frequently used to seek agreement. Tense is a grammatical notion, and refers to the way that time is encoded in language, typically through verb endings (inflections). The simple tenses (present and past) may be combined in English with the perfect and progressive. The grammar of how sentences relate to each other, rather than how a clause's internal elements relate to each other. A text-world is a mental image that is triggered by language and fleshed out by a reader's own background knowledge. For example, in the sentence the black dog looked menacingly at the nervous postman, a text-world is constructed out of nouns (dog, postman) and Modifiers in the form of adjectives (black, nervous) and adverbs (menacingly). My knowledge of the world (in this instance of dogs and postmen) fleshes out the detail - although there is nothing in the text that states it, I imagine the dog to be big and snarling, and the postman to be wearing a uniform and carrying a large bag. Thinking about language like this allows us to appreciate that the way we interpret texts is a result of two things: (1) the text itself, and (2) our own, unique personal experiences, memories and background knowledge. The displacement of a phrase to a clause-initial position for emphasis or prominence, as in Films, I enjoy (in contrast with the more typical ordering seen in I enjoy films). See also fronting, constituency test. A preposition that takes a noun phrase or clause as its Complement, as in since the war (began). See also intransitive preposition. A transitive verb takes at least one Object in a sentence to complete its meaning, in contrast to an intransitive verb, which does not. A graphical representation of the structure of sentences, clauses, phrases, etc. Not in conformity with the rules of a particular language. More specifically, this refers to words or strings of words which are not part of a language from the point of view of their syntax or morphology. For example, while Lily was eating a pretzel is a grammatical sentence in English, *Pretzel Lily a eating was is not, as indicated by the asterisk. Similarly unhappily is grammatical in English, but *lyhappyun is not. A term used to describe speech sounds whose production does not involve vocal fold vibration. A term used in pragmatics that refers to a sentence (or phrase or word) used in a particular context. Verbs constitute one of the major word classes, including words for actions (e.g. shout, work, travel) and states (e.g. be, belong, remain). There are two main types of verb: main verbs and auxiliary verbs. The surest way to identify verbs is by the ways they can be used: they can usually have a tense, either present tense or past tense (see also future). Verbs are sometimes called ‘doing words’ because many verbs name an action that someone does; while this can be a way of recognising verbs, it doesn’t distinguish verbs from nouns (which can also name actions). Moreover many verbs name states or feelings rather than actions. Verbs can be classified in various ways: for example, as auxiliary verbs, or modal verbs; as transitive verbs or intransitive verbs; and as states or events. Irregular verbs form their past tense typically by a change of vowel (e.g. break-broke, see-saw, eat-ate). Be aware that in the National Curriculum a sequence of one or more auxiliaries together with a main verb are regarded as forms of the main verb. For example, have eaten is a form (the perfect form) of the verb eat, and will have been being seen is a form of the verb see. In other frameworks such sequences are regarded as verb phrases. The forms a verb can take. For example, for be we have am, are, is, was, being, been; for walk we have walks, walked, walking, and for see we have sees, saw, seeing, and seen. The National Curriculum also uses this term to include tense and aspect. In this sense there are six different ‘tense’ forms of a verb: the simple present tense and past tense forms, plus the present and past forms of the progressive and perfect. A phrase whose Head word is a verb, called the main verb. The Head can occur alone or together with one or more auxiliary verbs. Note: Verb phrases are not defined in the National Curriculum glossary. But the definition above, of a phrase consisting of a main verb with optional auxiliary verbs, is not inconsistent with the National Curriculum's definition of a clause. The National Curriculum defines a clause as "a special type of phrase whose head is a verb". Provided we understand that this head may be more than one verb, i.e. a verb phrase, the definition is sound. A clause might contain other elements, such as a Subject or Object, whereas the verb phrase consists only of verbs. The parts of the body used in making speech sounds - lips, tongue, teeth, larynx, roof of the mouth, and the vocal cords. The area of the mouth above the larynx, including the vocal articulators (lips, tongue, teeth, etc.). It changes shape due to the way that vocal articulators move around, which in turn affects speech sounds. English has two voices: active and passive. It's easiest to see the difference in sentences with action verbs, for instance Anna threw the ball (active) versus The ball was thrown by Anna (passive). In the active example, the Subject (Anna) is the agent of the action and the Direct Object (the ball) is the patient, while in the passive the patient becomes the Subject. The passive is formed with the auxiliary verb be followed by a verb in the -ed participle form. A term used to describe speech sounds whose production involves vocal fold vibration. A vowel is a speech sound which is produced without any closure or obstruction of the vocal tract. Vowels can form syllables by themselves, or they may combine with consonants. In the English writing system, the letters a, e, i, o, u and y can represent vowels. The term 'vowel' is used in two ways: first, for a sound which is made with the mouth fairly open and which forms the central part of a syllable; and second, for a letter which is used to write a vowel sound, e.g. a, e, i, o, u. See also the contrasting term consonant. A word is a unit of grammar: it can be selected and moved around relatively independently, but cannot easily be split. In punctuation, words are normally separated by word spaces. Sometimes, a sequence that appears grammatically to be two words is collapsed into a single written word, indicated with a hyphen or apostrophe (e.g. well-built, he’s). The words in a word family are normally related to each other by a combination of morphology, grammar and meaning. A term used by linguists to refer to an interrogative clause that elicits either a ‘Yes’ or ‘No’ response. For example, Are you cold?, Would you like something to drink? See also yes-no question. A term used in pragmatics that refers to an utterance that can be interpreted as eliciting a ‘Yes’ or ‘No’ response. Typically, such an utterance would grammatically be a yes-no interrogative, but it need not be, as in the following example: She never went to San Francisco? Grammatically this is a declarative clause, but pragmatically it has the force of a yes-no question.